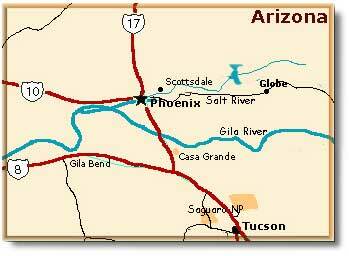 Tucson Arizona is located in south-central Arizona along the banks of the Santa Cruz River where Interstate 10 and 19 meet. It is situated in a high desert valley surrounded by 4 mountain ranges: the Santa Catalinas to the north, the Rincons to the east, the Santa Ritas to the south and the Tucsons to the west. Tucson Arizona is the seat of the University of Arizona, which was founded in 1885, home to Pima Community College and is near a number of Indian reservations. It is the gateway to Saguaro National Park, which is located on both sides of the city and the Arizona-Sonora Desert Museum. Every February, mobs of rockhounders, gem dealers, paleontologists, Native Americans, geologists and just plain curious converge on Tucson, Arizona for the annual Gem & Mineral Shows. The Tucson Arizona area has been inhabited for at least 12,000 years because of the protective mountains and the Santa Cruz River. Much evidence has been unearthed -- the remains of pit houses and adobe huts -- that the Hohokam occupied the area 1,000 to 1,500 years ago before mysteriously vanishing from the region. Father Eusebio Kino first visited the region in the late 1600s and he found the Tohono O'odham (Pima) Indians living and farming in the vicinity near or Chuk Shon (Tucson, meaning "village of the spring at the foot of the black mountain"), and in 1700 he established several missions in the area, including Mission San Xavier del Bac, 15 miles from the modern city. The "Old Pueblo" has lived under four flags (Spanish, Mexican, Confederate and US). On August 20, 1775 Irishman Hugh O'Connor, better known as Don Hugo O'Connor, was directed by the Spanish Crown to survey the area. He was to locate the best sites for presidios (military posts) and establish trade routes. In 1776, Don Hugo chose a site near the center of what is now downtown to establish the Presidio San Agustin. This was the northernmost outpost of Spain in the New World . When Spanish rule was superseded by that of Mexico, the walled town remained the military headquarters of the province. Tucson became known as a rowdy frontier town, tempered by social refinements brought by the city settlers. Shootouts took place frequently and men rarely ventured unarmed onto the streets. Still, the town prospered. By the early 1800s the population was over 7,000. Tucson lay in the territory that was acquired from Mexico by the United States in the Gadsden Purchase of 1854, and the town served as the territorial capital of Arizona from 1867 to 1877. Within a couple of years, Anglo-Americans began to arrive and the Butterfield Overland Stagecoach opened service to Tucson. To cope with the desert climate, these newcomers adopted much of the food, building techniques and other traditions the Mexicans had developed. Tucson's growth was further stimulated by the arrival of the Southern Pacific Railroad in 1880, the discovery of silver at nearby Tombstone and copper at bisbee and irrigation developments. Since World War II the city has experienced remarkable growth, partly due to the annexation of suburbs. Tucson's dry, sunny climate and unique desert locale have made it a popular tourist and health resort and retirement community. The city's postwar industries have centered on aircraft and missile manufacturing, dude ranching and electronics research and manufacture. 502,400 people / 2,389 feet above sea level. Tucson, Arizona is one of the sunniest cities in the US, with 3,800 hours of sunshine a year. Tucson's average yearly rainfall is about 11 inches. Expect occasional brief but intense thunderstorms in summertime. Because it's set in a desert valley, annual snowfall is low in Tucson proper, although there's enough for skiing in the nearby mountains. Low humidity and universal air-conditioning make even high summer temperatures bearable, which average a high of 98 F and an low of 70 F. March-April and October-November are when the temperatures are at their most pleasant with average highs of 80 F in April and 84 F in October. Winter (November-March) has an average high of 65 F and an average low of 38 F.
Benson, Arizona: 46 miles east. Willcox, Arizona: 82 miles east. Casa Grande, Arizona:63 miles north. Phoenix, Arizona: 116 miles north. Tubac, Arizona: 52 miles south. Tombstone, Arizona: 71 miles southeast. Fort Bowie National Historic Site: 117 miles east. Tumacacori National Historic Park: 46 miles south. Chiricahua National Monument: 120 miles east. Tubac Presidio State Historic Park: 42 miles south. Tombstone Courthouse State Historic Park: 71 miles southeast. Catalina State Park: 20 miles north. Picacho Peak State Park: 50 miles north. Tucson Mountain County Park: 10 miles west. Buenos Aries National Wildlife Refuge: 40 miles southwest. Sabino Canyon Recreation Area: within the city. Coronado National Forest: Surrounds Saguaro East. Cochise Stronghold Recreation Area: 77 miles east. Arizona-Sonora Desert Museum: 12 miles west. Biosphere 2 Center: 25 miles north. Boyce Thompson Southwest Arboretum: 95 miles north. Old Tucson Studios: 12 miles west. Kitt Peak National Observatory: 39 miles west. Coronado National Memorial: 105 miles southeast. Mission San Xavier del Bac Mission: Tucson.